Uplistsikhe Cave Town is part of the Tentative list of Georgia in order to qualify for inclusion in the World Heritage List. 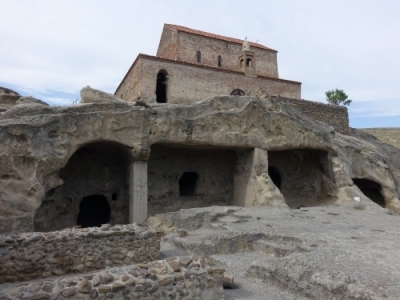 Uplistsikhe Cave Town is another easy day trip from Tbilisi. I visited it on my last afternoon in Georgia. From Tbilisi’s Didube metro and bus station I took a shared taxi with destination Gori – the driver was calling for passengers at the metro exit. 5 of the 6 spots in his car were quickly sold, but the final one proved to be difficult. I had planned to arrive at Uplistsikhe at about 16.30 to have 1.5 hours at the site until it would close for the day, so I was not prepared to wait indefinitely. In the end I paid up another 5 lari to get the taxi going. In Gori the driver dropped off everyone at his or her destination. Grabbing the commercial opportunity, he wanted to bring me all the way to Uplistsikhe (10 km away). Quite convenient for me, and I would worry about the return trip later (I easily found a taxi back to Gori). Uplistsikhe turned out to be a fully developed tourist attraction, with a full parking lot, a souvenir shop and a café. You also have to pay an entrance fee here, a rarity in Georgia. It costs 7 lari (2,35 EUR). The Cave Town of Uplistsikhe was inhabited since the 4th century BC. It developed into an important political, cultural and religious center in Antiquity. It remained inhabited until the 13th century. The city lies on a river and is built on and against a cliff. In its heyday, no less than 20,000 people lived here. It is hard to imagine that they all lived in caves: down on the ground there is also a large area with what look like ruins. I had mentally prepared myself for another demanding climbing expedition like at the David Gareji Monasteries. Fortunately though Uplistsikhe is a lot less steep and they have added 'real' steps. The whole area is not that big either: after the first climb you can already see the caves. They all look similar: opened up, sometimes with niches and stone benches inside. The ceilings are almost all blackened. There is little decoration, with the exception of a few ceilings and a pillar here and there. Towards the top of the cliffs the public buildings of the city were located, such as a basilica of considerable size. These, and the church at the top, date from the second flowering period of Uplistsikhe. The city had then developed into a Christian stronghold against the Islamic occupation of Georgia. In the end the invading Mongols caused the city to be abandoned. I'd recommend to visit Uplistsikhe when you have a few hours to spare in Gori or Tbilisi. Do not expect anything too spectacular though, as most caves are empty and the story about how they were used has been mostly lost (or never made it into an English translation). I wonder for example whether there were archaeological remains uncovered at the river level as well. Thinking of similar sites (Kernave!) the common people usually lived on the lower grounds and the nobility and priests at the strategically safe positions at the top. The Bradt Guide Georgia mentions "a village immediately to the west, whose inhabitants were removed in 1968", which might be an explanation of what is visible as well. Site visited just recently (July 2013). Easy accesible from Gori bus station by local marszrutka (small bus), last bus stop is just besides the bridge in Uplistsikhe village, from where there is just 500 meters to the Uplistsikhe Cave Town. Entrance fee for adults is 3 Lari (1.8 USD), for students and children it is 1 Lari. Comparing to Vardzia, Uplistsikhe Cave Town is relatively small, walking through caves cut out of the rock should not take longer than 2 hours. Some of the caves are remarkably decorated with carvings (do not miss Tamara's palace and single-pillar cave). Transport back to Gori - same bus stop, although the returning course may take some time. The whole trip may take 3-4 hours depending on local transport.